Photo of author courtesy of Dennis S.
I have six and a half years and 600 jumps in the sport. Being repeatedly mistaken for a tandem customer is one thing that hasn’t changed over time. It’s sort of a running joke amongst Black skydivers: ‘we’re not here for tandems.’ We've thought about getting t-shirts. The implication is clear, however: you don’t look like a skydiver. My home drop-zone is by now accustomed to the sight of a 6'1" Black woman boarding the plane barefoot, organizing new jumpers and using harness turns to eke out crosswind landings. Here I am mentoring newer jumpers. Here I am getting mentored and 'dirt-diving' a 20 way. Here I am playing chicken with the fence which may yet (one day) claim my canopy. Mostly, I feel free to be myself. Skydivers aren't all progressive but this drop zone seems to be. I like this place. I worry most about how the almost all White staff will react when I wear my 49ers #7 jersey (They didn't). Or if anyone will yell at me for my fixed wardrobe of brightly colored Afrocentric sweaters (they haven't). I hate feeling anxious over clothing but at my previous drop zone the White male owner got in my face and told me "you should be ashamed of yourself" when I wore my jersey. He never spoke to me again. Then a week later I was asked to leave. They said it was for "medical reasons." I am a skydiver with long term disability, yet, I had jumped there almost every weekend for the past three years. My drop zone before that thought it was okay for non-Black jumpers to casually use the n-word during business hours. Homophobic slurs were for after-hours when jumpers would get drunk and accost the only Black staff member. I was shocked; but should I have been? After all, experienced jumpers would make racist comments about the African American cash-poor community surrounding the drop-zone with a sly glance in my direction. An otherwise friendly instructor once enthusiastically told me that "at least I don't train my dogs to bark at Black people" apropos of nothing; leaving me to wonder what exactly transpired in the tidy row of trailers behind the hangar when I wasn't around. And why she told me—was it a warning? People for the most part seemed friendly or distant but I didn't feel comfortable there and I was reluctant to bring my family. So I'm happy to be in a much better place. Yet I feel the same anxiety at my new home drop zone that I feel in any predominantly White space in the South. Or anywhere. It's not a skydiving thing. It's a being Black in all White spaces thing that don't reflect the rich cultural or gender diversity of the United States. Something feels off. I know the space is not intended for me. I'm just a guest. If I complain about racist or sexist comments my "friends" magically become different people before my very eyes. Or maybe this is who they were all along. That’s what actually worries me—that I am a poor judge of character, or, as my mom occasionally told me as the only Black child in my class growing up—they are not your friends. The message is clear: I can 'find somewhere else to jump’ if I don’t like it here because they have no intention of changing whether the request is to stop using the "n-word" or to speak up against sexual harassment. I try to remember this and conduct myself accordingly. I think White women skydivers are also aware of the essential problem: occupying a space while lacking ownership. Every once in a while you see a colonizing attempt: pink and purple tights, a sequined tutu, a Pink Mafia jump (it involves Barbie dolls), pop music versus the requisite classic rock on the loudspeakers or a Sisters in Skydiving event with all of the above. An abundance of well-thought out accessories that inform the casual observer: this is a woman friendly place. Women are welcome here. Women are even celebrated here. Sometimes there are even women's record jumps which inevitably become All White Women's Record Jumps. When I look at the photos I feel as if I've stepped back several decades into my parent's Jim Crow childhood. Well, at least White women are making progress. And despite the outliers, White male skydivers have for the most part learned to be more supportive of them. A universally accepted truth is that a good drop zone has a higher than average percentage of women. Nobody wants to jump at a drop-zone that can’t retain women skydivers—least of all men. My workplace uses every official photo as an opportunity to showcase its commitment to gender and racial diversity; as an opportunity to send a message to recruits. We want you daughter of Sudanese refugees who speaks several highly coveted languages. We want you mechanic who dropped out of community college in a small midwestern town to support your family. We want you Vietnamese double major in economics and gender studies. We value diversity and we aggressively recruit diverse candidates. I work for the Army though, not the United States Parachute Association. I am acutely aware of my race whenever I look at glossy photos of skydivers in Parachutist magazine; searching row after row of White faces trying in vain to find someone who looks like me. That's exactly why I helped create Team Blackstar Skydivers; so men and women of color could see look at a photo of skydivers and see themselves represented. We're building a space where People of Color aren't just tolerated but celebrated. Team Blackstar gave me the freedom to stop pretending I don't notice when I'm the only person of color at my drop-zone. Yes we see Color. And we realize the lack of diversity isn't a neutral thing. As an Army officer, I've always been solution oriented, but, I also know that the mere mention of 'diversity' triggers an angry reaction in my drop zone 'friends' who don't understand what the fuss is all about. They are angry. Why are we talking about race? You're not supposed to do that. Talking about race makes them uncomfortable therefore no one is allowed to do it. Being the only Black person at a drop zone makes me uncomfortable, but I don't own this space therefore my thoughts and opinions don't matter. The unspoken expectation is that women and minorities should just be 'grateful.' Plus, "everyone knows the reason Black people don't jump is because they're just so poor," says a jumper who lives in a trailer on the drop-zone and packs parachutes in order to be able to afford to jump a few times a month. "How is that my fault?" According to the United States Parachute Association, skydiving is 87% male and 13% female so I guess women must be "poor too." If in 2014, 38% of a rapidly diversifying U.S. population are ethnic minorities and yet our sport doesn't reflect that, something is wrong. By 2020 over half of the children in the United States will belong to a minority group and by 2044 the US will be a minority majority population. Will our sport be obsolete by then? Are we okay with remaining the last hold out of White men who don't care about increasing diversity because 'it makes them uncomfortable?' What about our community doesn't appeal to People of Color who enthusiastically come out for tandem jumps only to never return to the drop zone? The sooner we view it as a problem the sooner we can work together towards a solution. 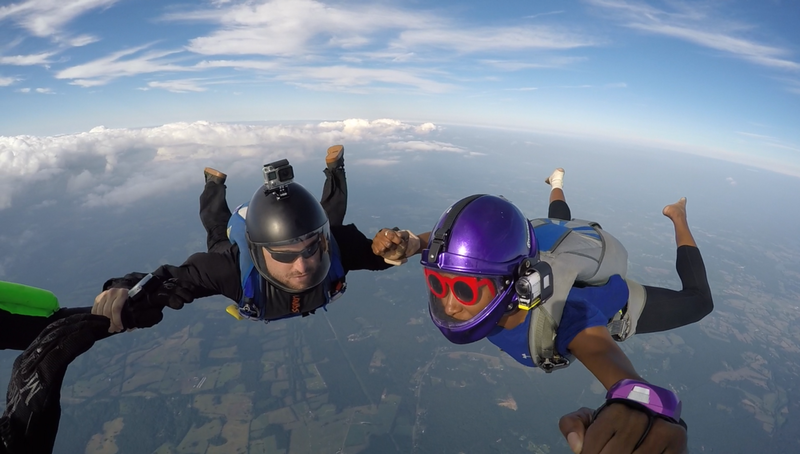 Skydiving has such a potential to tear down barriers, strip away offensive cultural stereotypes, and allow individuals to connect on a very basic human level. But it also has the potential to do the opposite. It's an elitist sport with a significant barrier to entry: cost. Skydiving lessons cost thousands of dollars plus another $3,000-$8,000 for equipment. Practice makes perfect and practice requires a lot money. This creates interesting socioeconomic divisions between skydivers spending tens of thousands of dollars each month on expensive indoor skydiving camps and skydivers selling plasma to be able to afford their next jump. However, the high cost of entry isn't what's keeping away the majority of women, or skydivers of color. Additionally, it's not a racially inclusive sport and the reluctance to talk about race will most likely ensure it stays that way. My friends would probably agree that I am highly invested in skydiving rules and traditions. One such rule is that skydivers are pied on the occasion of their 100th and 1,000th jump. [Editor’s note: we usually spring for whipped cream and empty pie tins so don’t worry; no one gets hurt] I pie total strangers. I sing happy birthday on the plane to skydivers I’ve only just met. I sneak away from a day of planned jumps to purchase supplies and make intricate plans involving iPhones, GoPro, a borrowed DSLR and other people’s friends. I organize celebratory jumps for friends and acquaintances—whatever is required to make the moment special. I usually fly camera step for newer jumpers because I remember how cool it was to see a video of myself in the air for the first time. And I remember how difficult it was to get experienced jumpers to jump with me when I had only 50 jumps in my logbook. I cheer for tandems and listen to their stories with real excitement even if I’ve heard them a hundred times. I make sure the beer fridge gets restocked. Over time, I’ve noticed my eagerness wasn’t always the result of being a part of a warm, welcome, inclusive community. It was born from my desire to create one. Because at the end of the day, that’s what drew me to skydiving in the first place. Six and a half years later, that is what continues to motivate me. I look forward to the day when our community is more diverse; when there are more skydivers of color and skydiving instructors who look like me (There’s currently one active Black female AFF and tandem instructor and she's pretty cool). But we can’t wish ourselves there. It’s going to take some work to create spaces that are inclusive of women, of People of Color, of queer folk. That means cleaning up the talk around the drop-zone, prioritizing professionalism, removing sexist, homophobic and racist language. You know the basics: women are not c—ts. We are women. Skydiving chicks aren’t sluts because we won't sleep with you. And we're not sluts if we do. We are women. Don’t make any unsolicited comments about women’s bodies. Don’t hit on your female students. Racial slurs are offensive; even if it’s just a meme or you think it’s funny. If you’re not African American don’t use the n word—as in not ever. That is never appropriate. Learn how to spell and pronounce your student's names—even if you think it's 'too foreign sounding.' If you're tempted to hit on 'the Asian girl' or ask her 'where are you really from?' when she tells you from she's from Chicago—don't. Two other assholes have already beat you to it this morning. Yes, she just wants to jump and no she doesn't like you. Then there are the more subtle arts of making folks feel welcome. It’s difficult to feel welcome in a space where no one looks like you or where the one woman instructor is publicly undermined, or where the promotional videos don’t include People of Color. It’s difficult to feel welcome in a place where the culture revolves around heavy drinking while other skydiving traditions are forgotten. It’s difficult to feel welcome in a sport where the leadership is not diverse or where the all white, all male tandem instructors complain with zero sense of irony that their African American tandem customers never return—or make ignorant comments about all Black people being poor. It’s difficult to feel welcome in a sport where I have to constantly explain why diversity is important, necessary—good for the bottom line to White guys who just don’t understand what the big deal is, or who “don’t see color,” or who feel threatened by it. I look forward to the day when I won't have to choose between jumping and having a dating life. Between jumping on the weekend and having Black and Brown friends. Until then this place is pretty good. Danielle gets high with a little help from her friends. Photo courtesy of Nathan D.